Hi, I am new to this forum. 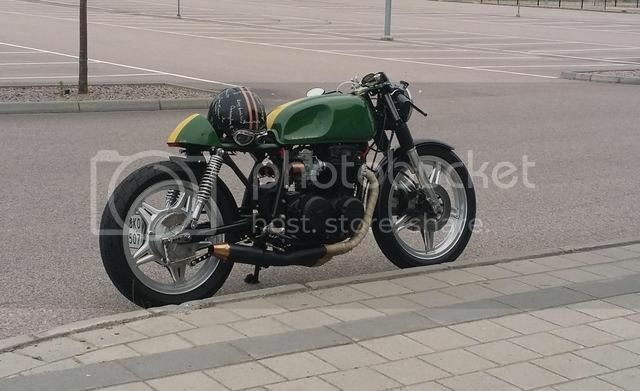 I am a guy from sweden that love to build caferacers. When I was younger Honda four was racers for me. I have never hade one so last summer I decided to buy one. I choose 650 for the weight/ power ratio. This is how it is turned up. This winter I will put a little better finnish on it. It is sprayed in lotus racing color. Cool! Welcome to the forum! Thanks, it is nice that cb650 has a dedicated forum. Nice bike! Where'd you get tank and seat? Can i ask if you replaced the original front end? it looks like an original front wheel, 19 inch, is it? Great thanks for your interest and kind words. (I am sorry for my english writing). Petroltank is original but I have beaten it up and gave it brand new knee dents. This is in the begining of beating the knee dents. It was a realy hard work. Then I took away fliller cap and took it apart so it was only just the cap left. Then I hammered the tank so the hole for filler cap came lower down in tank so it could not be sticking up in profil of the tank, put a cap from a jam jar on the old cap an drilled a hole in it putb in a hose for ventilation and voila it looked old for my eyes. Before I made the seat I modified the frame so it would be a little more narrow behind the tank, and shortened it. The seat, or if it is saddle (I dont Know) is made of sheat metal. Hammered in my workshop on the concrete floor to be bent in a small quarter of a ball. Welded together with the part that is the base for the actually saddle. Then I make one more base and dressed that in brown suede, bulted it right throw an in to some small attachment I had welded on the frame of the bike. Front end is original , I have just taken of the black paint. This is when i first came up on the lift. Amazing job. Looks great man! Welcome to the cb650 forum.